Tokhtamysh and the armies of the Golden Horde rally in front of Moscow, 1382. Tokhtamysh (tat. Tuqtamış) [n 1] or Tokhtamısh  (died 1406), a prominent khan of the Blue Horde, briefly unified the White Horde and Blue Horde subdivisions of the Golden Horde into a single state. He descended from Genghis Khan's grandson, Tuqa-Timur. 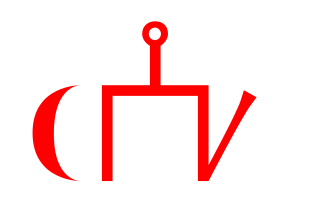 Khan is a title of Turkic origin for a ruler or military leader. It first appears among the Göktürks as a variant of khagan and implied a subordinate ruler. In the Seljuk Empire it was the highest noble title, ranking above malik (king) and emir. In the Mongol Empire it signified the ruler of a horde (ulus), while the ruler of all the Mongols was the khagan or great khan. The title subsequently declined in importance. In Safavid Persia it was the title of a provincial governor, and in Mughal India it was a high noble rank restricted to courtiers. After the downfall of the Mughals it was used promiscuously and became a surname. The full extent of Tokhtamysh's authority. Tokhtamysh appears in history in 1376, trying to overthrow his uncle Urus Khan, ruler of the White Horde, and fleeing to the great Timur. Tokhtamysh outlived Urus and both his sons, and forcefully ascended to the throne of the White Horde in 1378, with Timur's backing. Urus Khan was the eighth Khan of the White Horde and a disputed Khan of the Blue Horde; he was a direct descendant of Genghis Khan. 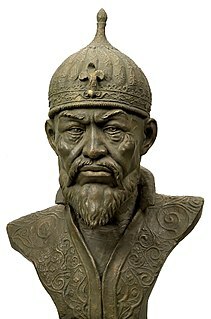 Urus himself was the direct ancestor of the khans of the Kazakh Khanate. Timur, historically known as Amir Timur and Tamerlane, was a Turco-Mongol conqueror. As the founder of the Timurid Empire in Persia and Central Asia, he became the first ruler in the Timurid dynasty. According to John Joseph Saunders, Timur was "the product of an islamized and iranized society", and not steppe nomadic. Tokhtamysh dreamed of emulating his ancestors and made plans to reunite the Golden Horde. In 1380, he invaded the Blue Horde by fording across the Volga, and defeated Mamai during the Second Battle of the Kalka River. The ruler of the Blue Horde, Mamai, was killed shortly after the Battle of Kulikovo, marking Tokhtamysh's victory and the reunification of the Golden Horde. The Volga is the longest river in Europe. It is also Europe's largest river in terms of discharge and drainage basin. The river flows through central Russia and into the Caspian Sea, and is widely regarded as the national river of Russia. Mamai, of Kiyat descent, was a powerful military commander of the Golden Horde. Contrary to popular misconception, he was not a khan (king), but a warlord and a kingmaker for several khans, and the de facto regent of the Horde in the 1370s. His defeat in Battle of Kulikovo marked the beginning of the decline of the Horde, as well as his own. Having reunited the Blue and White Hordes into the Golden Horde, in 1382, Tokhtamysh led a successful campaign against Russia as a punishment for the Kulikovo defeat - setting back, though not ending, the Russian aspiration to free themselves of Tatar rule. In just six years, Tokhtamysh had reunified the lands of the Golden Horde from Crimea to Lake Balkhash. The Siege of Moscow in 1382 was a battle between the Muscovite forces and Tokhtamysh, Khan of the Golden Horde who was supported by Timur. Russia, officially the Russian Federation, is a transcontinental country in Eastern Europe and North Asia. At 17,125,200 square kilometres (6,612,100 sq mi), Russia is the largest country in the world by area, covering more than one-eighth of the Earth's inhabited land area, and the ninth most populous, with about 146.77 million people as of 2019, excluding Crimea. About 77% of the population live in the western, European part of the country. Russia's capital, Moscow, is the largest metropolitan area in Europe proper and one of the largest cities in the world; other major cities include Saint Petersburg, Novosibirsk, Yekaterinburg and Nizhny Novgorod. Extending across the entirety of Northern Asia and much of Eastern Europe, Russia spans eleven time zones and incorporates a wide range of environments and landforms. From northwest to southeast, Russia shares land borders with Norway, Finland, Estonia, Latvia, Lithuania and Poland, Belarus, Ukraine, Georgia, Azerbaijan, Kazakhstan, China, Mongolia and North Korea. It shares maritime borders with Japan by the Sea of Okhotsk and the U.S. state of Alaska across the Bering Strait. However, Russia recognises two more countries that border it, Abkhazia and South Ossetia, both of which are internationally recognized as parts of Georgia. The Tatars are a Turkic-speaking people living mainly in Russia and other Post-Soviet countries. The name Tatar first appears in written form on the Kul Tigin monument as ృృ఺ (Ta-tar). Historically, the term Tatars was applied to anyone originating from the vast Northern and Central Asian landmass then known as the Tartary, which was dominated by various mostly Turco-Mongol semi-nomadic empires and kingdoms. More recently, however, the term refers more narrowly to people who speak one of the Turkic languages. Dmitry Donskoy had raised a large army to defeat and suppress the Mongol–Tatar hordes, and, after defeating Mamai during the Battle of Kulikovo, could not raise another army against Tokhtamysh Khan. Realizing the enmity the unruly Dimitry had unleashed, Tokhtamysh marched against Moscow. After three days of siege, Tokhtamysh was faced with a stalemate, until Donskoy's brothers-in-law opened the gates and allowed the massacre of the city's inhabitants. The destruction of Moscow led to Dimitry's surrender to the authority of Tokhtamysh at the end of 1382. Tokhtamysh also took Donskoy's son hostage. Muscovites gather during the Siege of Moscow (1382). Warriors of the Golden Horde attack Moscow. Timur and his troops gather to launch a war against the Golden Horde Khan Tokhtamysh. Believing he could defeat the Ilkhanate Chobanids and capture the disputed territories of the Caucasus since the days of Berke Khan, in 1385 Tokhtamysh, with an army of 50,000 (or five tumens), invaded Persia and took Tabriz. Returning north they took 200,000 slaves from the Caucasus, including tens of thousands of Armenians from the districts of Parskahayk, Syunik, and Artsakh. This proved to be a fatal error for Tokhtamysh, who moved north from the Caucasus, thus allowing his Ilkhanate rivals to side with Timur, who annexed Persia to his own expanding kingdom. Furious, Tokhtamysh turned back and made war on his former ally. Eventually, Tokhtamysh conceded defeat and withdrew to the steppe. However, in 1387 he suddenly invaded Transoxiana, the heart of Timur's realm. Unfortunately for Tokhtamysh, heavy snow forced him back to the steppe. In 1395, the scenario reached its climax as Timur attacked the Golden Horde and defeated Tokhtamysh at the Terek. Timur sacked cities of the Golden Horde such as Azov (Tana), Astrakhan  and Tokhtamysh's capital, Sarai Berke. Timur captured artisans and craftsmen of the Golden Horde, and placed a puppet ruler, Koirichak, on the throne of the White Horde and appointed Temür Qutlugh khan of the Horde. Tokhtamysh escaped to the Ukrainian steppes and asked for help from the Grand Duke Vytautas of Lithuania. 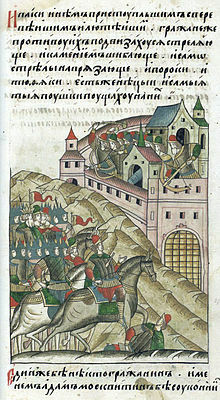 In the great Battle of the Vorskla River (1399) the combined forces of Tokhtamysh and Vytautas were defeated by two of Timur's generals, khan Temur Qutlugh and emir (murza, visir) Edigu. The defeated Tokhtamysh was killed near present-day Tyumen by Edigu's men in 1406. He was the last khan who minted coins with Mongolian script. ↑ The spelling of Tokhtamysh varies, but the most common spelling is Tokhtamysh. Tokhtamısh, Toqtamysh, Toqtamış, Toqtamıs, Toktamys, Tuqtamış, and variants also appear. This is a timeline of major events in the Muslim world from 1400 AD to 1499 AD. The Battle of the Vorskla River was a great battle in the medieval history of Eastern Europe. It was fought on August 12, 1399, between the Tatars, under Edigu and Temur Qutlugh, and the armies of Tokhtamysh and Grand Duke Vytautas of Lithuania. The battle ended in a decisive Tatar victory. Hagı I Giray was the founder of the Crimean Khanate and the Giray dynasty of Crimea. As the Golden Horde was breaking up he established himself in Crimea and spent most of his life fighting off other warlords. He was usually allied with the Lithuanians. Edigu (1352–1419) was a Turkic Muslim Emir of the White Horde who founded a new political entity, which came to be known as the Nogai Horde. Mengu-Timur or Möngke Temür (?–1280), son of Toqoqan Khan and Buka Ujin of Oirat and the grandson of Batu Khan. He was a khan of the Golden Horde, a division of the Mongol Empire in 1266–1280. His name literally means "Eternal Iron" in the Mongolian language. The Tokhtamysh–Timur war was fought from 1389 to 1395 between Tokhtamysh, khan of the Golden Horde, and the warlord and conqueror Timur, founder of the Timurid Empire, in the areas of the Caucasus mountains, Turkistan and Eastern Europe. The battle between the two Mongol rulers played a key role in the decline of the Mongol power over early Russian principalities. Temür Qutlugh was a khan of Golden Horde in 1397–1399. He was a son of Timur-Malik, khan of the White Horde, who struggled against Tokhtamysh. After the death of Temur Malik in 1379 Qutlugh was reared at Tokhtamysh's court. After an unsuccessful revolt against Toqtamysh in 1388, he, along with Edigu, fled to Timur. During the Tokhtamysh–Timur war in 1391–1395, they founded an independent ulus (district) in the region of the lower Volga and Ural Rivers, placing their capital in Saray-Jük. After the defeat of Tokhtamysh, Qutlugh, with Edigu's help, was crowned as Khan of the Golden Horde, although Edigu was the real holder of power. In 1398, Qutlugh coined his own money, and in 1399, he participated in the battle of the Vorskla River. He was killed in a conflict with Tokhtamysh's son. Shadi Beg, Khan of the Golden Horde (1399-1407) was a son of Timur-Malik. After the death of his brother; Temur Qutlugh, Shadi Beg was enthroned with the help of Edigu as Khan of the Golden Horde in 1399. The same year, Edigu went to Siberia to exact revenge on Toqtamysh who had killed his father. During Edigu's absence Shadi Beg tried to strengthen his power over the Horde, but when Edigu returned he dethroned Shadi Beg and enthroned his brother, Pulad Khan in his place. Shadi Beg escaped to the Caucasus mountains where he died. He held the west while his uncle Koirijak ruled the east. According to Rashid-al-Din Hamadani (1247–1318), Genghis Khan's eldest son, Jochi, had nearly 40 sons, of whom he names 14. When he died, they inherited their father's dominions as fiefs under the rule of their brothers, Batu Khan, as supreme khan and Orda Khan, who, although the elder of the two, agreed that Batu enjoyed primacy as the Khan of the Golden Horde. Orda, along with some of his younger brothers, ruled the eastern wing of the Golden Horde while Batu and others ruled the western wing of it. These Hordes are known as the "White", "Blue" and "Grey" (Shaybanid) Hordes in Slavic and Persian historiography. The two main divisions are also known as Batu's Ulus (district) and Orda's Ulus. Jalal al-Din Khan ibn Tokhtamysh (1380–1412) was the Khan of the Golden Horde in 1411–1412. He was the son of Tokhtamysh, Khan of the Golden Horde until 1395. He is also famous for his written history of the Mongol Empire. He is also known as the Green Sultan. Sary-Aka's embassy was a mission from the commander of the Blue Horde Mamai sent to Russian Eastern border province of Nizhny Novgorod in 1374 to undermine the influence of the Prince of Moscow in his struggle for supremacy among the Russian provinces and due to his open opposition to Mongol authority in Russia. The embassy was ambushed and the survivors were imprisoned in the wooden fort of Nizhny Novgorod until the 31st of March 1375 when Sary-Aka with the rest of Tatars were massacred by Russians. Vasily Demitryvich Kirdyapa was the eldest son of Dmitri Konstantinovich of Suzdal and Nizhny Novgorod, a Prince of Suzdal (1364–1382) and Gorodets (1387–1403). He was the ancestor of the senior branch of a Rurikid noble family, and the Princes Shuysky. ↑ Kołodziejczyk 2011, p. 5. Kołodziejczyk, Dariusz (2011). The Crimean Khanate and Poland-Lithuania: International Diplomacy on the European Periphery (15th-18th Century). A Study of Peace Treaties Followed by Annotated Documents. Leiden: Brill. ISBN 9789004191907.